Janet WATSON was born on 7 February 1856 on Peebles Street, Ayr, Ayrshire, Scotland to Thomas WATSON and his wife Mary HUNTER. Thomas and Mary were tenant farmers on Mosshill Farm, Dallmellington Road, outside Ayr. Thomas also worked as a ‘carter’, probably to supplement the family income, and he was not present at the time of Janet’s birth. Perhaps he was away on a carting job. Or perhaps, as a farmer, Thomas may have had a strong “draught” horse which, when it wasn’t used for ploughing would be hired out. Thomas may have been away delivering or picking up the horse. Photo: Janet, about 1930 in Ellisboro, Saskatchewan, Canada. Photo from the author’s collection. At Mosshill Farm baby Janet joined two older brothers, a half-brother William [William WATSON] born in 1847 and a brother Thomas [Thomas WATSON] born in 1854. A sister Isabella [Isabella WATSON] born in 1858, completed the family. In an age of large families the Watson family of four children would be considered small. In 1861 Janet, 5, was a ‘scholar’ the term used for children who attended school. The census that year also tells us that Mosshill Farm had ’60 acres’. Sometime after the 1861 and before 1871 census, the Watson family moved to Mount Oliphant Farm just outside Ayr. The farm had some renown as the previous home of Robbie Burns during the poet’s childhood. Mount Oliphant was a larger farm, here Thomas was able to rent 71 acres. The 1871 census showed the Watsons as a farming family; as well as her farmer father Thomas, Janet’s mother Mary also listed her occupation as ‘farmer’. As was done from all the working farms in the area, Mary and possibly her daughters drove the ‘jig’ [horse and cart] into Ayr to a market where she sold her butter and cream to the townspeople. Janet’s 16 year old brother Thomas is listed as ‘farmer’s son’. Her half brother, William, was away from home. Janet, 15 years old, who would have finished school, gave her occupation as a ‘general servant’ an indication that she may have been employed elsewhere, likely to bring in some money and supplement the family income. If she had been working on the farm her occupation would normally be described as ‘farmer’s daughter’ or ‘farm servant. Perhaps she worked at a nearby farm, walked to work each day, and returned home in the evenings. The day of the census she was at home with her parents, brother Thomas and sister Isabella. A 14 year old ‘farm servant’, Charles Blackley also lived and worked on the farm. Two years after her father’s death, on 22 November 1880 Janet, 24 years old, married Gilbert SPEIRS, aged 22. The wedding took place at Janet’s home of Mount Oliphant farm; Janet listed her occupation as ‘dairy maid’ and her usual residence as Mount Oliphant Farm. Gilbert, a farm servant, listed his address as Mount Ferguson Farm which is the farm next to Mount Oliphant. It is likely that Gilbert and Janet met as they were neighbours, or Janet may have even been a dairy maid at Mount Ferguson; the farms still exist and are within easy walking distance of each other. Gilbert was born on 10 October 1858 in Balichmorrey, Barr by Girvan, Scotland, a son to Ivie Alexander SPEIRS, a ploughman, and his wife Euphemia SIMPSON. Janet and Gilbert did not stay long in the Mount Oliphant Farm / Mount Ferguson Farm area; perhaps there was not work or accommodation for a young married couple. Within six months, by the April 1881 census Janet, 25, and Gilbert, 28, were on the Rankinson Farm in the parish of Coylton, where Gilbert worked as a dairyman. In this census Janet has become 3 years younger than Gilbert; perhaps this was more socially acceptable? Mary Thomson, 14, lived with them as a servant. Perhaps Janet and Gilbert had ambitions of running a dairy together, as dairyman he may have had a little autonomy, and the reason for the servant was to assist in the dairy (unskilled) as well as their house? That same 1881 census showed Janet’s brother Thomas (26) had taken over responsibility for renting Mount Oliphant Farm, and her mother Mary (53), sister Isabella (23) also lived and worked there; perhaps Janet visited whenever she could as Rankinson Farm was not far away. The siblings and their mother stayed close all their lives; a bond that would support them over the years and the three countries of Scotland, Canada and USA. In 1888, Janet’s and Gilbert’s only child, Janet, was born. Although I have not been able to locate her birth registration her Saskatchewan death registration listed her birth as 22 December 1888. Scottish census records indicated that she was born either in Saltcoats, Ayrshire, Scotland (1891 census), or Kingarth, Buteshire, Scotland (1901 census). The 1911 census adds to the confusion as Janet, 22, listed her birth place as ‘Argylshire Inellan’. Whichever is correct it appears that Gilbert and Janet frequently moved, itinerant tenant labourers always looking for work or a better opportunity. By 1891 Gilbert, 33, was a shepherd and Janet, 35, a housekeeper for a farmer named Mitchell, on Overton Farm, Killearn, Stirling. As was the practice, Gilbert likely had taken a year’s contract to work as a shepherd on the understanding that his wife Janet would keep house for the combined household of the Speirs family, plus the farmer Mitchell and a 39 year old ploughman James Ewing. Janet, their daughter, was two years old in this census. By 1901 Janet and Gilbert had moved again (and there may have been several moves in between census years); Gilbert was a farm servant and Janet worked as a dairymaid at Rankinston Farm, Ayrshire. Their daughter Janet attended school in the area. Rankinston Farm is where they had lived in twenty years earlier in 1881. In the early 1900s Watson family experienced many changes. In 1904 the tragic and unexpected death of Janet’s younger sister Isabella left a family of young children motherless. Janet’s brother-in-law John McConnell was not able to look after all the children by himself. Isabella and Gilbert lived in the area and no doubt spent time helping the McConnell family cope. Around this time, Janet and Gilbert moved to Chapeldonan Farm, near Girvan in Ayrshire which was not far from the McConnell family. The extended Watson family had grown: Janet and Gilbert Speirs and their daughter Janet; Isabella and John McConnell’s seven children; and Thomas and Jane’s seven children. The period in Scotland from 1904 to 1913 for the extended family is not clear. What is clear from the postcards, shared photographs and existing records is that the three families were in close contact, visited when possible and continued to help and support one another. In the early 1900s the Canadian government mounted an advertising campaign to attract settlers to western Canada. Land agents, who traveled throughout England and Scotland, extolled the virtues of emigration with the promise of free land and the opportunity for advancement. Newspapers carried advertisements, and in some cases letters from those who had already emigrated who encouraged others to follow. It was a lure that many young men could not resist. In 1906 the extended Watson family began to move to the ‘new world’. The first of Janet’s nephews to leave Scotland was 17 year old Jim [James Muir WATSON], second eldest son of Janet’s brother Thomas and his wife Jane. After Jim arrived in Montreal in June of 1906 he travelled to Winnipeg, Manitoba by train and worked for a farmer as an agricultural labourer. In 1907 an important family tie to Scotland was broken with the death of Janet’s mother Mary, age 81. Mary died on 07 July 1907, of bronchitis, at Chapeldonan Farm, Scotland. Gilbert was the informant of her death which suggests that Mary lived with her daughter Janet and son-in-law before her death. In June 1909 another of Janet’s nephews, John McCONNELL, son of Janet’s deceased sister Isabella emigrated to the United States; his ship docked in New York City on June 21, 1909. John was a carpenter and may have been attracted to the opportunity to use his trade in the building boom on the eastern coast of the United States. He eventually settled in New Jersey, however he may have made at least one trip to Saskatchewan, perhaps with a thought of moving to Canada and farming. The summer of 1909 saw another of Janet’s nephews leave Scotland. 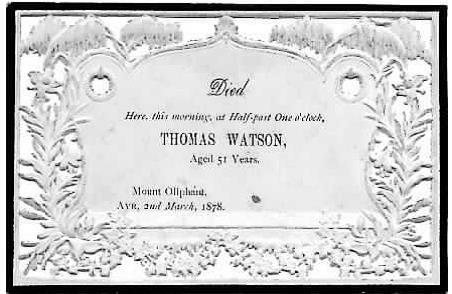 Bill [William Watson Muir WATSON], 17 years old, third eldest son of Janet’s brother Thomas and his wife Jane, sailed from Glasgow on the ship ‘S. S. Hesperian’ and arrived in Quebec City on 19 July 1909. Like his brother Jim, Bill’s eventual destination was Manitoba to work as an agricultural labourer. 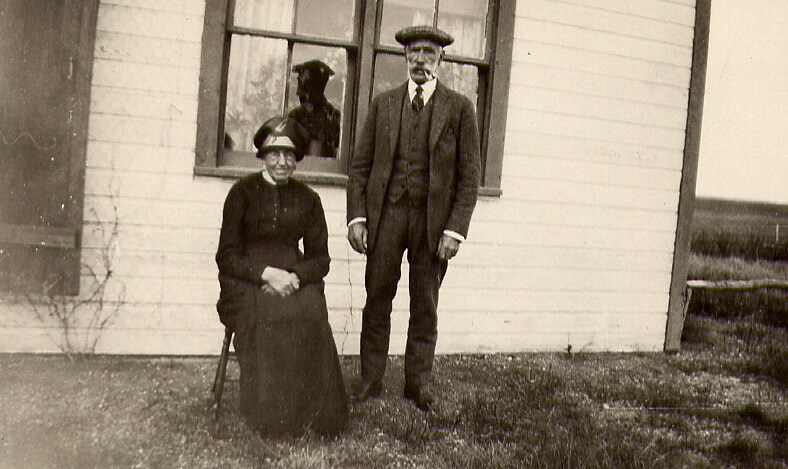 By 1909 Janet’s brother Thomas and his wife Jane had decided to join their sons in Western Canada. 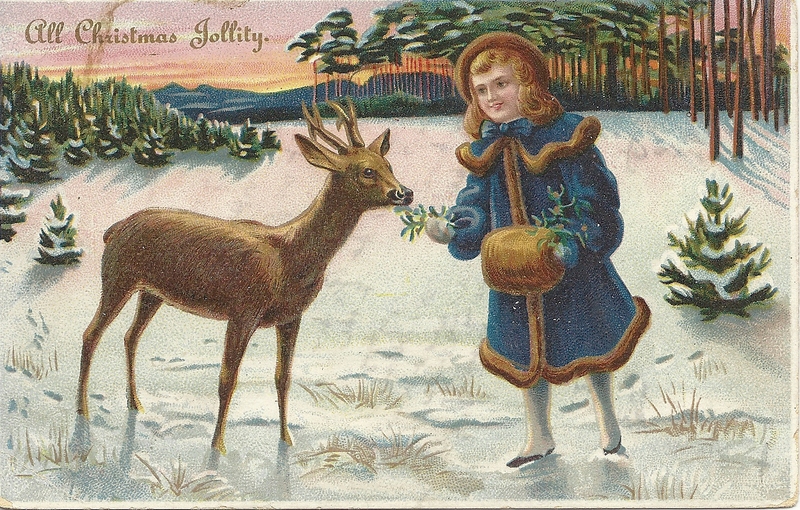 In Janet’s Christmas post card to her nephew Bill that year indicated their decision. 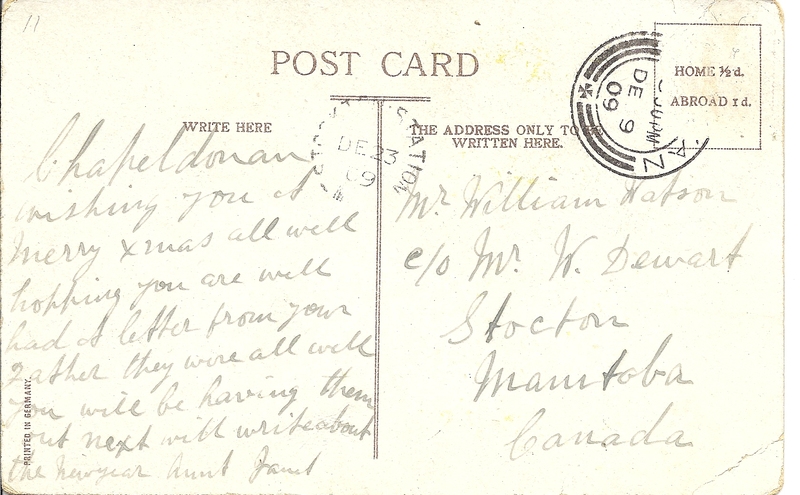 The post card below, in Janet’s handwriting was mailed to her nephew William [Bill] Watson who worked on a farm near Stockton, Manitoba. The post card was mailed 9 December 1909, and delivered in Canada 23 December 1909. The postcard is from the author’s collection. As Janet predicted in her Chritmas post card, on 2 April 1910 her brother Thomas (56 years old), sister-in-law Jane (45 years old), and four of their children left Glasgow, Scotland on the ship ‘S. S. Hesperian’. The ship docked in Halifax on 11 April 1910. The Watson children that accompanied their parents were Nell [Helen McNab WATSON], (20 years old), Alex [Alexander Hunter WATSON] (15 years old), Jean [Jane Muir WATSON] (11 years old), and John [John McConnell Muir WATSON] (7 years old). Janet had misgivings about moving to Canada, as can be seen by a postcard [not shown here, see post 12 May 2013] sent 9 September 1910, by her daughter Janet to Janet’s cousin Nell (“Write and give me all the news about the paces you can. I am still on the notion to go our but mother thinks I am just as well where I am but I will see“). However, perhaps jobs were becoming scarce for Janet and Gilbert, or family were encouraging them to come to the ‘new world’ which had opportunities for advancement. On 2 November 1912, Janet, her husband Gilbert and their daughter Janet boarded the ship S.S. Cassandra in Glasgow. With them was Elizabeth Wyllie McCONNELL, 17, Janet’s niece [see post 26 April 2013]. The group disembarked in Montreal, Quebec on the 12th of November. The ship’s passenger list showed that their destination was Wolseley, Saskatchewan. Gilbert gave his age as 57 and his occupation as ‘labourer’, Janet, 54 (who continued to shave a couple years off her age) was a ‘housewife’ and Janet, (their daughter), 23, was a ‘domestic servant’. A train journey took them to Wolseley, Saskatchewan, where no doubt they were met at the railway station by members of the Thomas and Jane Watson family. Christmas 1912 Janet, her husband and daughter would spend with her brother Thomas and his family. 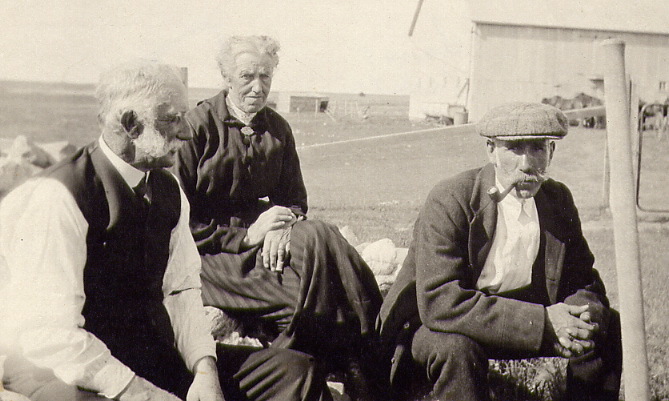 Photo: Left to right – Thomas Watson, his sister Janet (Watson) Speirs, his brother-in-law Gilbert Speirs (with the ever-present corn cob pipe). Taken about 1918 in Saskatchewan, Canada, photo is from author’s collection. Photo right; Janet and Gilbert Speirs, at their home in Ellisboro, about 1930. From the author’s collection. Some time before her death Janet moved the home of their daughter Janet who had married John INGLIS. 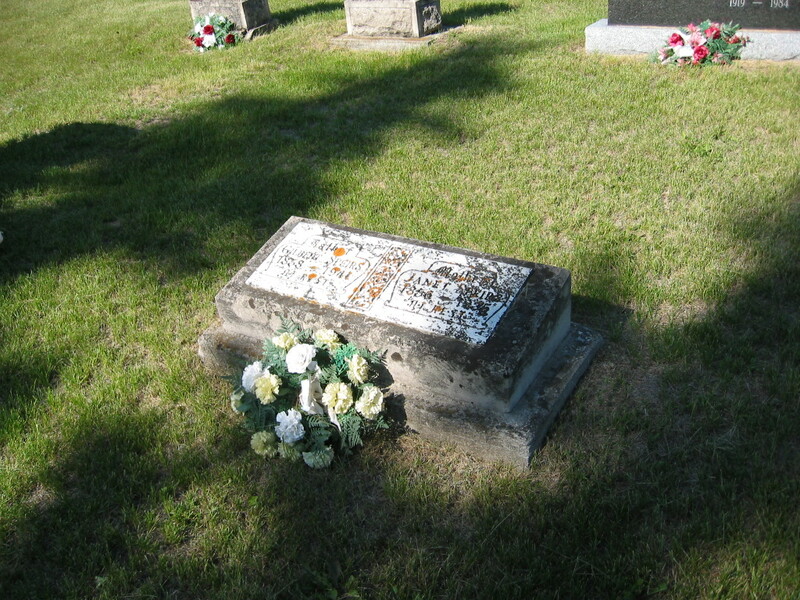 [see post 12 May 2013] where she died on 19 February 1935. Death memorial card right was sent by Janet’s daughter Janet (Speirs) Inglis to her cousin William Watson McConnell in the United States. This card is now (in 2013) in the collection of William McConnell’s daughter, Mary Smith, who lives in Tennessee, USA. For the next while Gilbert lived with his nephew James (Jim) WATSON and his wife Agnes (Nancy) ACTON on their farm in the Qu’Appelle Valley. Jim Watson’s son Samuel Acton WATSON remembered that, as a boy growing up on the farm, one of his jobs was to take a plate of supper out to the shed or shack that had been fixed up for Gilbert to live in. 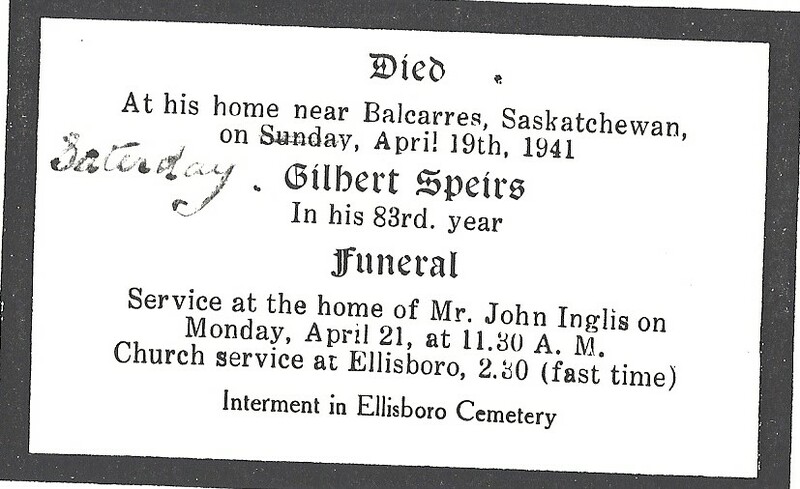 Gilbert died, at the home of his daughter Janet and son-in-law John Inglis on 19 April 1941. Gilbert’s daughter Janet also sent notice of her father’s death to her cousin William Watson McConnell in the United States. As with Janet’s death memorial card, this card is now (in 2013) in the collection of Mary Smith, William McConnell’s daughter. 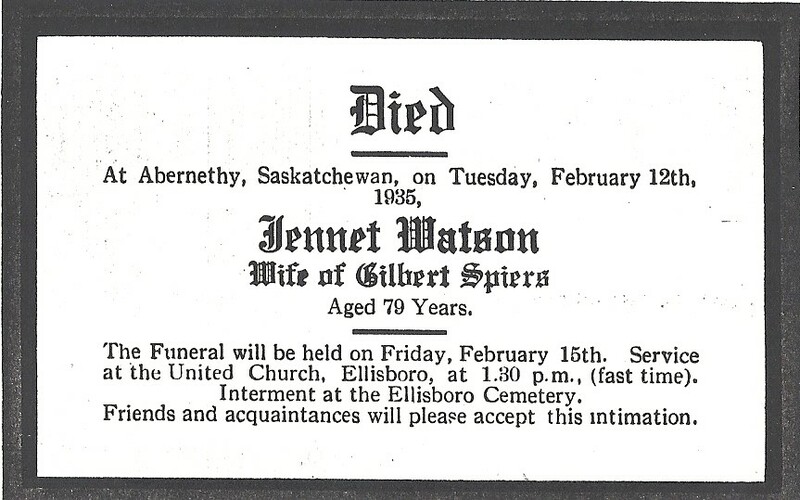 Janet and Gilbert were buried in the Ellisboro Cemetery, beside the grave of Janet’s brother Thomas Watson and his wife Jane Muir. Photo from the author’s collection.